With this product, you earn 209 rewards point(s). Seen it cheaper? Let us know! If you have seen the same quality lamp somewhere else, let us know! We will do our best to meet or beat the price. Northstar AV sells OEM (Original Equipment Manufacturer) Lamps - Philips, Osram/Sylvania & SHP brand lamps inside of OEM spec housings. We DO NOT sell generic or compatible replacement lamps. Shipping Method: Free Shipping by UPS Ground. 1. Make sure you use gloves when handling projector lamps. Oils and deposits from your hands that may not be visible can create hot spots that can result in premature lamp failure. Wear clean gloves during installation to avoid this potential complication. 2. When replacing the lamp housing, be sure that the new housing is seated completely. Apply gentle pressure at the base of the unit until the housing is fully secure. 3. Make sure all of the air filters of your projector are clean out or changed regularly, as indicated in the projector's User Manual. An obstruction such as a clogged filter will not allow proper venting of the unit. This can cause the unit to overheat. Overheating is a major cause of premature lamp failure. 4. Do not place anything on top of the projector or in front of the intake or exhaust vents. Doing so will cause the projector to overheat. 5. Do not unplug the projector until the lamp has properly cooled. After the projector has been shutoff, the fan remains on to allow the lamp to cool evenly and completely. Proper cooling also decreases the chance of premature lamp failure. 6. Do not move the projector for at least one hour after the projector has been shut down. If the lamp is still warm, vibration can cause the lamp to stress, crack or explode. 7. Do not turn the projector on and off frequently during presentations. When the projector is switched on, the surge of power causes stress on the lamp. Try to minimize on/off cycles. 8. Many digital projection displays offer "Low Lamp," "Eco-Mode" or "Economy Mode" options. These settings help extend the life of your lamp and save you time and money. 9. Most importantly, MAKE SURE YOU SHUT THEM OFF! Leaving a projector on overnight is a sure way to burn up your lamp. If you have any questions please feel free to contact us any time. A friendly Northstar AV sales member will be happy to help you. You can email us at sales@northstar-av.com or visit the contact us page on our website. 1.What is the difference between Original (OEM) & OEM compatible lamps? OEM stands for (Original Equipment Manufacturer). These lamps are the original lamps your projector or television came with. They are specifically designed to work in your unit. However, OEM compatible lamps are copies of these lamps. They are built by other companies to the specifications of the original manufacturer. The compatible lamps can sometimes have less then optimal performance. 2.Who makes projector lamps? Out of all the projector and RPTV manufacturers out there, there are only a few major lamp manufacturers with high enough standards that are used. These companies are Philips, Osram, Phoenix (SHP) and Ushio. 3.Why should I buy an Original lamp? There are many reasons you should purchase an original lamp over a compatible. The 2 most important factors are performance and life-time of the bulb. Many knock off or compatible bulbs aren’t built with the highest quality materials and precision. In some cases the bulbs color can be off or the brightness is severely impaired. Secondly, with an original bulb you can be sure you are getting the full lifespan out of your replacement lamp. With a compatible bulb it is more of a gamble. 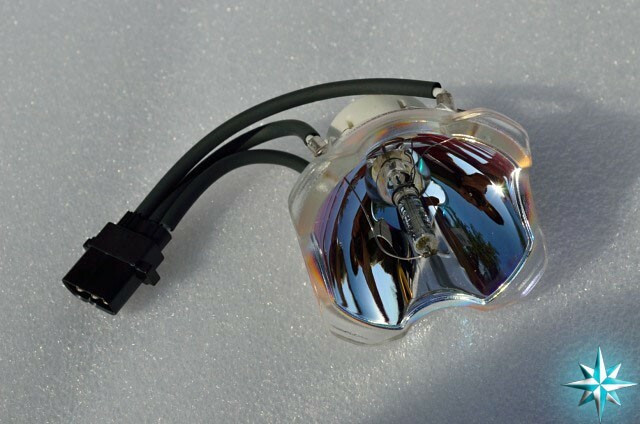 Also Original (OEM) lamps come with full 90 day warranties. 4.Why we recommend Osram or Philips bulbs? The answer is simple; they are the performance leader in the industry. Their lamps out last and outperform all others. They also come will full replacement warranties. 5.What is a generic lamp and why don’t you sell them? Generic lamps are cheap knock off lamps built with substandard components and precision. This results in a significantly shorter life cycle and subpar performance. Although these lamps are considerably cheaper then original or compatible lamps the pros do not outweigh the cons. We simply will not sell them.